Short dental implants have been proposed as an alternative to other methods of bone augmentation for the prosthetic treatment of atrophic alveolar ridges. The aim of this review was to systematically evaluate clinical studies of implants < 10 mm in length, to determine short implant-supported prosthesis success in the atrophic jaw. Searches were conducted in Medline and six relevant peer-reviewed dental journals for all types of clinical study designs except for case reports written in English. The authors screened eligible studies, conducted quality assessment and data extraction independently. The main outcomes were implant survival, incidence of biological and biomechanical complications, and radiographic peri-implant marginal bone loss. Cumulative survival rate (CSR) = 99.1% (95%CI: 98.8-99.4). Biomechanical success rate = 99.9% (95%CI: 99.4-100.0). A higher CSR for rough-surfaced implants. The provision of short implant–supported prostheses in patients with atrophic alveolar ridges appears to be a successful treatment option in the short term; however, more scientific evidence is needed for the long term. Annibali S, Cristalli MP, Dell’aquila D, Bignozzi I, La Monaca G, Pilloni A. 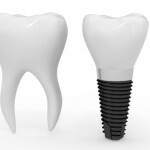 Short Dental Implants: A Systematic Review. J Dent Res. 2011 Oct 27. [Epub ahead of print] PubMed PMID: 22034499. See Dental Elf July 18th for links to two other reviews on short dental implants.